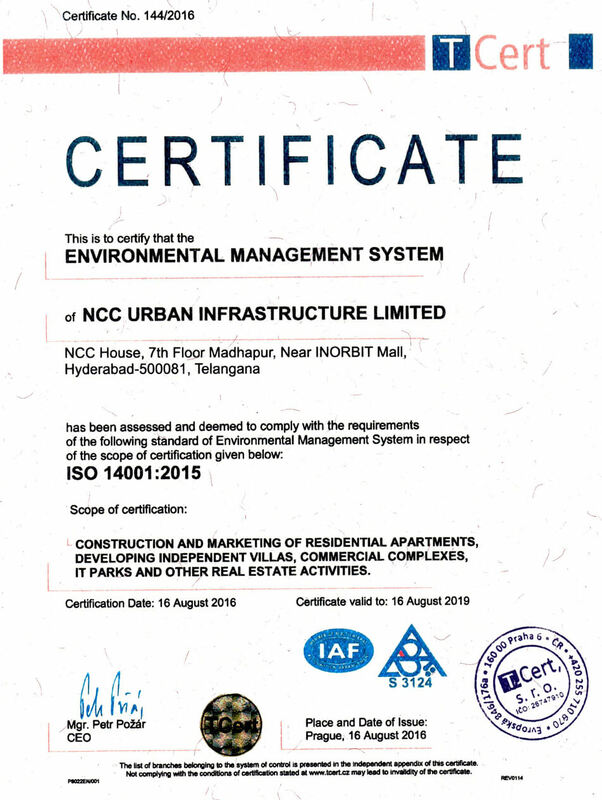 NCC Urban Infrastructure Ltd. is a Subsidiary of NCC Limited and comes Equipped With a world class building techniques and state-of-the-art building infrastructure that is expertly commandeered by top-notch professionals. 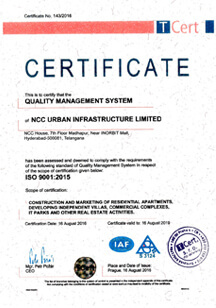 NCC Urban Infrastructure's quality operations span across Residential and commercial complexes, townships, SEZs and serviced apartment complexes. The company has an impressive pan India presence across Bengaluru, Hyderabad, Kochi, Vizag, Guntur, Ranchi and Dubai. Strict adherence to superior standards on time deliveries and transparent documentation has made preferred destination for individuals who are looking for quality living at affordable prices. NCC Urban has inherited its experience and expertise from NCC Limited. Known for its excellence in the execution of Turn key projects, Industrial Buildings, Multistoried, Commercial structures,Townships, Roads, Bridges, Pipelines etc. and rated as growing Infrastructure Company in India with annual turn over nearly Rs. 8,200 crores. NCC Urban is developing the prestigious National Games Housing Complex Project in Ranchi, Jharkhand. 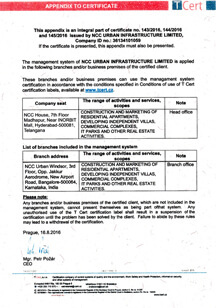 The Company has also acquired lands in and around Bengaluru, Chennai, Goa, Gurgaon, Hyderabad, Kakinada, Lucknow, Raipur and Vizag for its Real Estate projects. 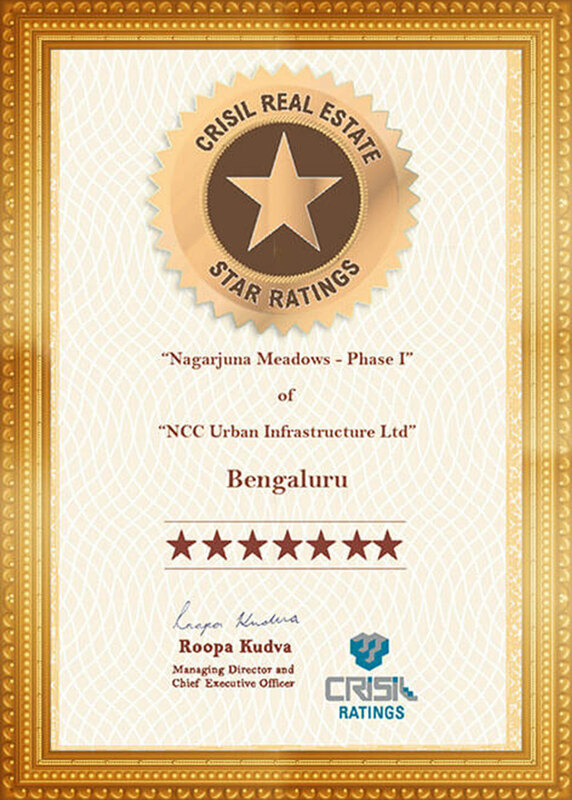 NCC Urban is all set to deliver 12.8 million sft. of built up area spread over 286 acres in the next three years. To be a world - class infrastructure enterprise committed to quality, timely completion, customer satisfaction, continuous learning and enhancement of stakeholder's value. To build a strong future ensuring increased returns to shareholders and enhanced support to associates. To adopt latest technologies in development, operation & maintenance of infrastructure projects. To encourage innovation, professional integrity, up gradation of knowledge and skills of employees and a safe working environment. To be a responsible corporate citizen committed to the social cause. 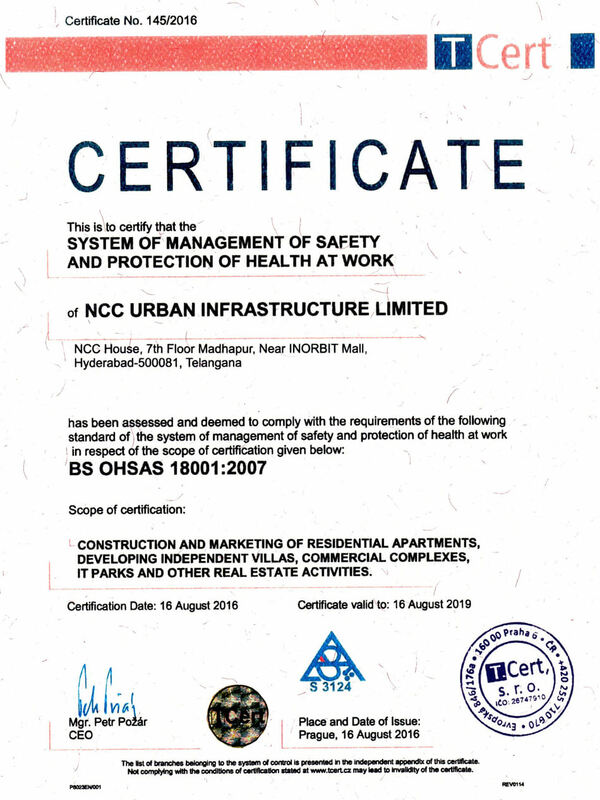 NCC Urban is strongly committed to safety and accident prevention on project sites and work places to ensure that accidents do not take place, employees' morale and satisfaction is improved, and in turn, the performance of Company is enhanced. One of our priorities is to protect the environment and the health and safety of the people who work for us. The effective management of health and safety and protection of the environment are integral to our business success. 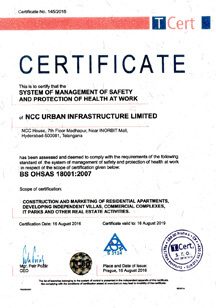 Everyone at NCC Urban is accountable for health, safety and environment (HS&E) and we work hard to foster a culture where these three factors are taken into account wherever we operate. NCC Urban integrates HS&E into all areas of its operation, so that its sites are healthy and safe for all who work in them. 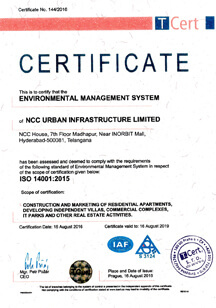 NCC Urban is committed to carrying out all its activities without detriment to the Environment. 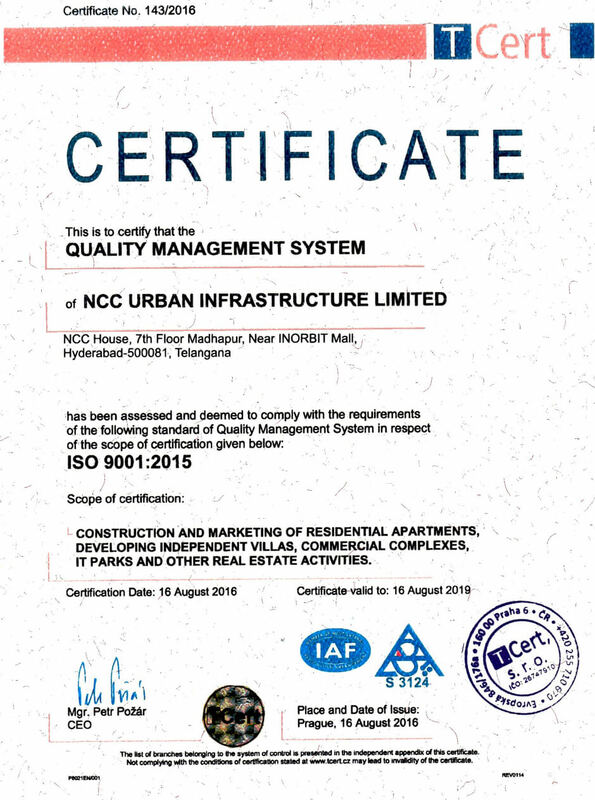 NCC Urban strives to achieve enhanced customer satisfaction by delivering quality product through timely completion with safe working environment. We dedicate ourselves for continual improvement in all fields of our business. To consistently deliver the quality product by adhering to the set specifications, contractual, regulatory and statutory requirements. To achieve enhanced customer satisfaction through cost-effective and timely completion. To motivate and train the staff for continual improvement of quality standards. To update and implement the procedures complying with international standards. 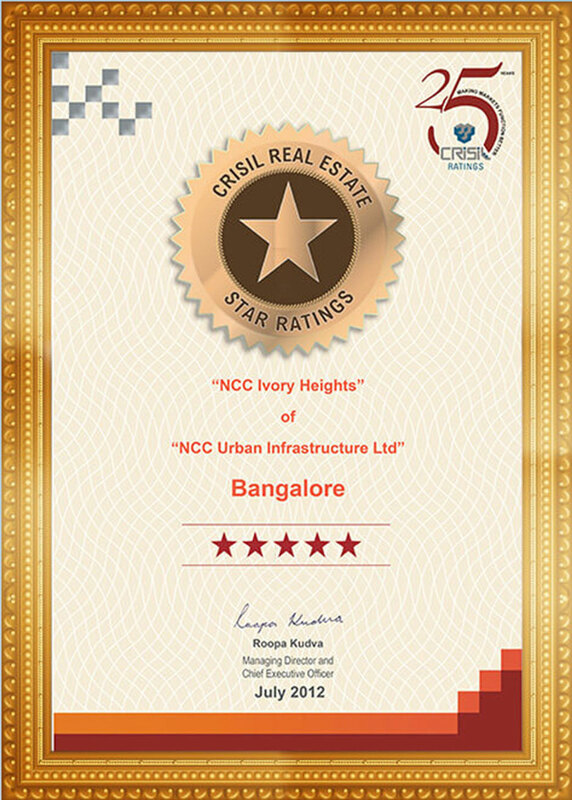 NCC Urban has inherited its experience and expertise from NCC Limited. Known for its excellence in the execution of Turn key projects, Industrial Buildings, Multistoried, Commercial structures,Townships, Roads, Bridges, Pipelines etc. and rated as growing Infrastructure Company in India with annual turn over nearly Rs. 6,200 crores. © Copyrights . 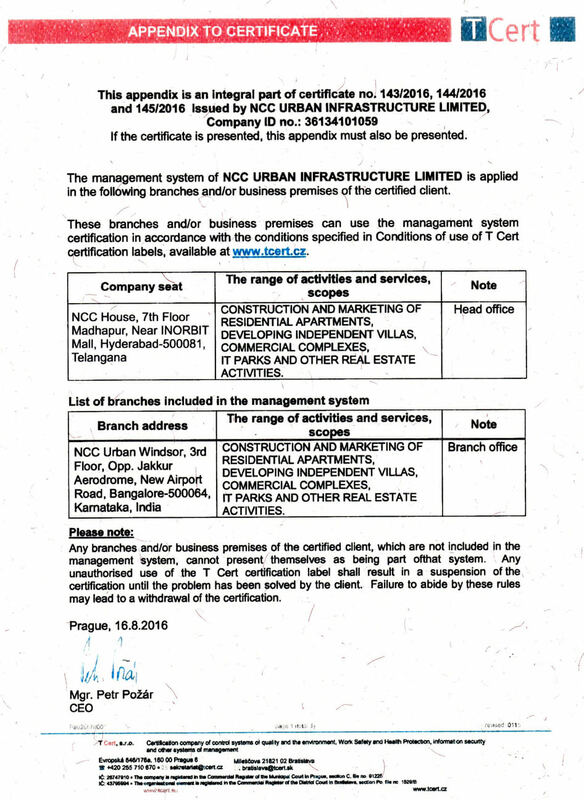 NCC Urban Limited. All rights reserved.